The scene of the fire in Langley Mill. Three men have gone on trial accused of the murder of two teenagers and a six-month-old baby who died in a flat fire in Derbyshire. 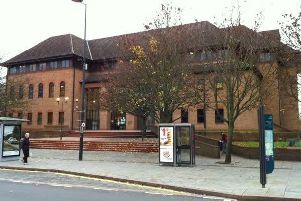 Peter Eyre, 44, and his sons Simon Eyre, 24, and Anthony Eyre, 22, of Central Avenue, Sandiacre, appeared at Nottingham Crown Court on Tuesday for a trial which is expected to last four weeks. The three are accused of the murder of 17-year-old Amy Smith and her six-month-old daughter Ruby-Grace Gaunt, and friend Ed Green, 17, at Amy’s house on North Street, Langley Mill. In the Crown’s opening statement, the jury was told evidence would show a row over the theft of a moped was the ‘catalyst’ which led to the three deaths in the early hours of Sunday, June 21, 2015. As the five people in the two-storey flat tried to escape, they rushed to the front door but were unable to open it, the jury was told. “The front door (made of PVC) was already failing due to the fire and the lock could not be be undone,” Mr House said. “In the panic the teenagers turned and ran back up the stairs. Ed Green didn’t make it and was overcome by smoke inhalation. Shaun Gaunt (Ruby-Grace’s father) and another friend, Joshua Holt, were able to escape through a window with the help of neighbours. The jury heard the three accused had prepared for the crime, arriving sometime prior in Peter Eyre’s black Skoda ‘for reconnaissance’. The attack was allegedly sparked by an altercation between Eyre’s fourth son, Aaron Henshaw, who was accused by Shaun Gaunt of stealing his moped. Peter, Simon and Anthony Eyre each deny three counts of murder.